It also should be said that this adventure is completely nonlinear, and there really is no right or wrong way to approach the game. The purpose of this walkthrough is to offer just one of the many ways one can proceed with the adventure and get the most out of it. …Yes, I know that the magnifying glasses are quite old. Oops! Well, he won’t be winning any beauty pageants, now will he? Better click outta’ here, before he bites us! Let us turn the ringer in the center of the door and open it…. Which undoubtedly you have all brought with you. --tells us that he has made the study of “the paranormal” his life’s work. It is here at Hobbs Manor that Dr. Grimalkin advises us that he has gathered together all of the knowledge, artifacts, books, papers, photographs filled with eye witness testimony, expert’s videos (and even a few “professional” ghost-hunting gadgets for our perusal on this occasionally disturbing yet always compelling subject) for the purpose of assembling evidence which he hopes will -- once and for all -- either prove or disprove the existence of GHOSTS. The good doctor has set forth a challenge for us to meet: to discover the evidence awaiting us within the walls of this ancient Manor-house and to decide for ourselves the answer to his question: Do Ghosts really exist or are they only the things that go bump in the night? He invites us to search and look in every nook and cranny of his stately home for the proof we need. I knew they’d leave… tsk! Ahhhennmm! If I may have everyone’s attention?!!! You’ll notice that as the learned Dr. Grimalkin is speaking to us, the Main Hall seems to contain a lot of interesting areas. Make note of them. There is a staircase to the left and a staircase to the right, and upon each of these there are peculiar paintings, which line the stairs. Straight in front of us, we can see a Deep Sea Diving Helmet flanked by a closed door on either side of it. Under each side staircase (which undoubtedly leads to the second floor) we should take note that there is one hall-table per side. On your left side, the table seems to have a green manila file folder placed upon it. The right side table sports a few artifacts (Hmmm, where in our travels and other adventures have we seen these before? Better make note of these as well, as we might need them later.) 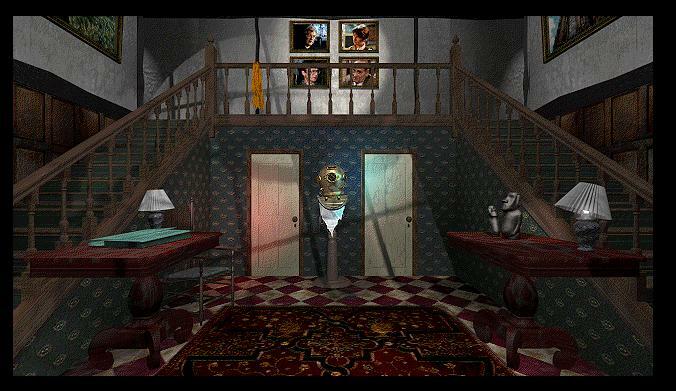 As we back up from the hall table with the two “totems” on it, in the upper right area we see a single doorway. Turn to the right again and we have a view of the Hall from where we entered. On the left there seems to be a Jacobean breakfront; if we look closer, we can see a perfectly ordinary photograph surrounded by a lovely wooden frame (but don’t click on the photo just yet.) Notice as well, the painting on the wall just to the right of the photograph. This is one of the many hauntingly beautiful pieces of artwork, which Dr. Grimalkin has painstakingly collected over the years. Each one, we will soon discover, has a story connected with it. Some, like this one we will be able to study a little closer -- others we will be able to view but only from a distance -- yet the legends will still be there for us to uncover. Oh! Oh, dear… did you see that? The painting changed! And there’s the good doctor again. What was it he said? These are words of wisdom to be sure. 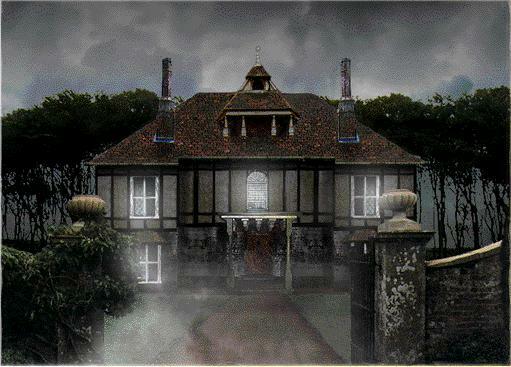 We will find as we examine various items that Dr. Grimalkin will pop in from time to time commenting on the items we are looking at by either explaining their purpose or sometimes offering ageless superstitions, sage advice or “folkloric” wives’ tales as we make our way throughout the Manor. Turn to the right again and we can see the other side of the Main Hall. There seems to be a set of closed double doors here; and to the left of them what looks like a strange pink marble mask, carefully positioned atop a brass stand, which closely resembles an obscure double sundial, a large hall mirror, and some intricate vases. We should take note that they are here, as well as two more paintings on the wall of the left staircase and will come back to them in good time, but at the moment we cannot disregard the green manila folder on the table just under the stairs. Let’s do have a look, shall we? Go ahead and open the manila folder. What did you find? Yes, excellent! Please, don’t say a word…we shouldn’t poke fun at other people’s last names. --also, there is a leaflet entitled “Ghosts and Spirits in Religion”. Well, what are you waiting for? This is what you’ve searched all over Ebay for…to find this game… let’s get started then, we have much to do. Let’s take a closer look at Father Nutty… oops! I meant Father Nuttall’s photo file. He looks like a nice enough man, doesn’t he? From the file, it basically says that he is the parish “Ghostbuster”. Then read the leaflet to learn about how some religions view the supernatural. Interesting, huh? I don’t remember any of that from Sister Mary McCarthy and Catechism during my high school days at Sacred Heart Academy. Next, let’s take a look at the videotape, just click on the tape box and then when it opens up click on each question on the left to get a sense of how the Catholic Church views possession, hauntings and exorcism. Well, that was an eye-opener. Back out twice. Next, turn right and have a closer look at that Diving Helmet. Gee, whilickers! What an unnerving story… I wonder if he was talking about 20,0000 Leagues Under the Sea? Was there a Mr. Montague in that story? Hmmm and I thought that it was just a legend. You know, many legends do have the basis in fact. Back away from the Diving Helmet and turn either to the right or left and then turn once again so that you are facing the front door. Let’s take a closer look at that photo on the Jacobean side- board on the left. Click on the photograph and then click again and watch the portrait begin to glow with the greenish hue of ghostly ectoplasm as the first of many of the eyewitnesses recount the Tale of the Forest and the Trumpeter. Epilepsy could strike us at any age, you know. And usually it strikes more men than women. Or the Living Room (for us Yanks….). Let us go in and see what kind of trouble we can get ourselves into. Turn to the right to view two more photographs. I bet they talk too. The trick here is that you have to click at least twice for each picture. Let’s see. … a number of them. Next, let’s examine the coffee table. Interesting. My grandmother had flocked wallpaper in her front vestibule that was very similar to the design we see here. When one would look at it as it was on the wall, it appeared quite normal: an “allover” fleur-de-lis pattern, red on dark red. But, when one would walk through the hallway and pass by the hall mirror, out of the corner of one’s eye one could distinctly see faces on the wall in the mirror’s reflection. It was truly uncanny, and something that my entire family experienced. An experience, which we still speak of today when we all get together and reminisce. It’s time for “Viewpoint” on Telly! Go over to the Television set and click on it to turn it on. It’s Viewpoint with your host “Rhea Searcher”. Listen to the story of “The Nanny from Yorkshire”. Turn towards the fireplace and examine it thoroughly. Oh! It’s Dr. Grimalkin again with yet another wives’ tale. You know, my grandmother used to make us look for burnt cinders that were in the shape of coffins…. Personally, I always thought it was to get us to clean up her hearth. To get out of the “fireplace loop” click until you are centered, you should be able to see part of the hearth and the mantle clock, then pull the cursor to the left and click when you see the arrow change into the pointing hand. Follow it over to the desk. Click on the closed desk. When the desk opens up we see a desk blotter with a number of things on it. Click on the center photo file of Dr. Susan Blackmore. With a Doctorate in Parapsychology, Dr. Blackmore is the skeptic within the Four Musketee-- …er…. I mean our four experts. We still have two more yet to meet. Next, read her thoughts on Poltergeists: Introduction and Case Histories. In this thesis we will learn about poltergeists in general, The Rosenheim Poltergeist and The Miami Poltergeist Case. Have fun…let me know when your done …I’ll be over here looking for faces in the wallpaper. No, you’re not!!! Did you think I wouldn’t know that you skipped through that thesis? Ok, but next time, watch it … the wallpaper has its eyes on you lot… and so do I. Next, click on the photographs above the videotape box to learn about Vickie Taylor and The Case of the Sleeping Toilet Roll. Now comes the videotape. Click to open and we find our third expert Tony Cornell who shares this interview tape with Dr. Blackmore. On the tape Mr. Cornell relates to us his most frightening experience as a “Shattenjaeger”. Dr. Blackmore retells how she was able to dismantle The Case of the Jumping Clock and also gives us her take on the Rosenheim Poltergeist. Where will we find the next case? In the briefcase, where else? Click on the briefcase to bring it forward and then click once more to open it up. Ah, yes! I remember this from Time Magazine! This is The Enfield Poltergeist Case, which took place in 1977 and ‘78. There are a number of things to see here. First read the introduction to the case itself. Now click on the videotape to see Maurice Grosse, Ghost Hunter Extraordinaire, and main parapsychological investigator in this case speak about the beginnings of the Enfield Poltergeist, its psychological effect on the surrounding neighbors and “the voice” of the poltergeist itself. Then click on the notepad. Remember, as you read the first page of the notepad, click on each line. This will take you to a more in-depth description of each item. Scroll carefully on the expanded note. If you see a downward arrow click on it, as it will scroll the text of the note up for more information. As you finish reading through each expanded piece of evidence just click on the notepad in the lower left hand corner to return to the notepad page. There are two main pages in the Notepad. Next click on the photos above the videotape box. This particular case is actually quite disturbing when you think about it. And what poltergeist party would be complete without the notorious “audiotape” crammed full with the sounds of things that go bump in the night? Let’s have a listen. Click on the audiocassette and we will see a list of thirteen items to absorb. From hearing objects fly across the room, to tappings, to the interviewer getting creamed by the nasty ghostie, to hearing pictures being pulled from the wall, to the ghost of Bill and Bill’s voice…all and all this is really quite chilling. Well then, let’s shake off the “whillies” and back away from the Enfield Poltergeist. Put the cursor on the far right of the screen (you should see that your magnifying glass will now have a minus sign inside of it). Turn to the right and then right again, we should be facing the door. Take one step forward and then turn to the right. Oh yes, here we are…. These are the “Expert Portraits”, more on them in just a minute, but for now let’s turn again to the left. We really should have a little more light in here so that we can see what we’re doing, don’t you think? Would someone be so kind as to click on the lampshade? Yes, thank you, and now if you would just click once more to turn it on, then? … I couldn’t help myself. Click on each portrait to find out their answers. Exit from the Lounge to the Main Hall. Enter the Main Hall and travel straight across to other side where the double doors are, but before we enter, let’s turn to the left and have a better look at that wacky mask. Uhh… There he is again… sooo; those were his colleagues, huh? I see. Upon entering The Library turn to the right and then turn back to the left. This room looks pleasant enough, doesn’t it? Click on the jade ashtray on the table in front of you. Oops! See that??? I have a feeling that we are not alone here. Alrighty then! Turn back to the left and go forward to the bookcase with the skull. It is here that the GHOST STORIES begin. There are six of them hidden throughout the Manor, each one of them beautifully told to us by Dr. Grimalkin. The trick is to find them. 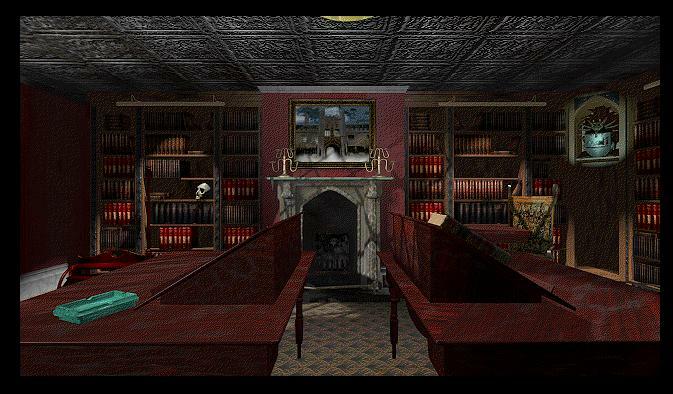 Here in the Library we find the first one entitled Bettiscombe Manor and The Screaming Skull. Just click twice on the obvious, sit back and listen to a tale of terror and dread. 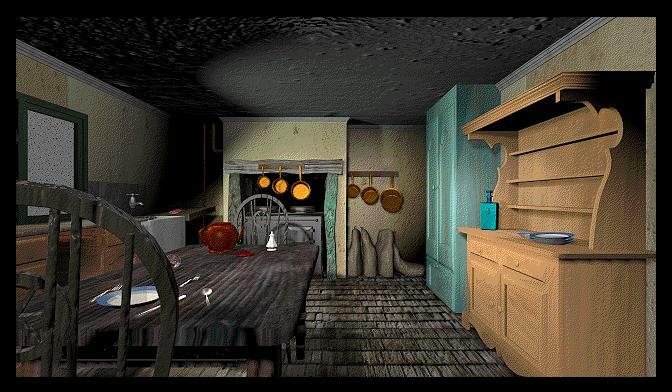 When we are finished listening to the ghostly tale, back out and visit the fireplace, then turn right once again and continue ‘round the room. See the turquoise Coat of Arms in the corner of the room? Make a note of it, for we will leave it for now and come back to it later. Continue on across the Library room until you come to “The Flying Book”. Actually, that really isn’t the title of the book at all; it’s called “The Book of Hauntings”. We may open the book now if you are in the mood for another ethereal tale from times gone by. But I suggest that you only read one or two more stories for now as we still have a lot to discover. There are over 216 ghost stories and legends from all over the English countryside contained within the pages of this book, and almost as many pictures, but more on that later. For now, we must pull ourselves away from The Book of Hauntings. Turn to the left and then straight on into another photograph and listen to an eyewitness recount a ghostly experience about an Abbey in Surrey and a group of hooded monks. Once this is done we will leave The Library for the moment. Click forward until you are inside the kitchen. Hmmmm seems nice and clean. Let’s first check out the teapot on the table. Care for a spot of tea? Yetchth! Well, somehow my guess about the old adage “Here’s looking at you, Kid” would be an understatement here… Bletch!!! Let’s try the overturned wine glass, which is also on the table. Oh! Hello there, Dr. Grimalkin. I was wondering were you had gotten your self to. Let us turn from these two gory reminders of the macabre and make our way towards the back of the kitchen and the stove. Examine all the pots and pans. … Oops! Forgot to warn you to wear the gloves… Well, no harm done, it’s only a multimedia piece, anyway… It isn’t as through you could really die in this game… Mwuhahahaahaaa! After you’ve finished with the sink turn to your left and head for the postcards located further down the counter. Click on the post cards to get a better view (you should see 3 groups). Then click once more to begin the slide show. This particular slide show, presents 31 superb photographs of England’s most eerie settings. Many of them are described on further detail in the Library. Remember the Book of Hauntings? If you’ll notice: there are two opposing directional arrows at the top of the “remote”. These will allow you to scroll backwards and forwards as besuits your humor. The “Continue” button, when clicked, will allow for an unencumbered view of the postcard. Just click again anywhere within the postcard to bring back the “remote” and continue the slide show. The “Export” button is utilized here to make screenshots if one so desires. Simply click on the “Export” button and a directory tree window will appear. In the upper left box, type a title for the image you wish to export (the images are exported as. BMP(s) or “bitmap” files). Then click through the directory tree on the right side until you locate the folder that you wish to export the image to. I always use the folder “GHOSTS”. This function will work only if you remember to include a “)” symbol after the Title and before the .BMP extension. If you forget it, it will give you an error message saying that the file is invalid. When you have completed the slideshow, click on the “Exit “ button to exit. Back away from these entrancing shadows and let us turn to the right. Click on the drawer. Ahhhahha! A corkscrew…Hmmmm….It might be important. Maybe we should click on it. Well, then… it’s the good Doctor once again. What did he say? Ok, what does that mean…? Better do as he suggests and make a note. Back away from the drawer and go forward, right, forward to the blue, whitewashed cupboard. Click on it to open. Hey, Happy Halloween! Ahhh! I just love pumpkin pie don’t you? Let’s click on him… Feeling hungry yet? Whoops! … He is, I think. We better back out of there quickly before we get into trouble. I think it would be good idea to move over to the yellow sideboard. What a pretty blue bottle! Anyone care for a drink? Maybe we should have a closer look? Let’s click on it. All rightly, then! We’ve found the second ghost story. Sit back and listen to Dr. Grimalkin tell the ghostly tale of “The Case of Nell Cook and The Cannon of Canterbury Cathedral”. Can you imagine being buried alive? Puts a new spin on the saying, “Do not judge, lest ye be judged”, huh? Let us back out from Dr. Grimalkin and the sideboard. Turn right, forward three times, and then turn left. Exit the kitchen back into the Main Hall. Open the door to the Main Hall and move forward three times and then turn left, move forward and then turn left and then left again. We should be facing the right side staircase. Move up the staircase going forward once. Turn left …. Whoa! Gee Dr. Grimalkin just seems to be everywhere, doesn’t he? Pretty sage advice, don’t ‘cha think? Turn right and then move forward. We find ourselves up on the balcony of Hobbs Manor. If we turn to the left, we can see from here that on the wall there are four “Expert Portraits” waiting for us to examine. Let them wait for now and turn back to the right and then forward to the closed door in front of us. Open the door. Enter the Nanny’s Room. Seems cozy enough, doesn’t it? Turn to the left and notice the embroidered chair. There seems to be a book on it. Let us have a closer look. … a Photo Album of Spirits! How exciting! Let’s open it. Let’s us listen and learn from one of our “experts”; The Shattenjaeger, Maurice Grosse, as he explains each “Spirit Photo” in the Album, we can also click on these one at a time to enlarge them and have a closer look. Move the cursor to the far right of the album to turn the “pages”. Double exposure? Trick photography? Or could it be the evidence of the Spirit World? What do you think? Back out of the album and turn to the right. Shall we cross the room to the bureau? Let us first have a closer examination at the foot of the bed. ....Very funny, ok, which one of you lost his head? Maybe we should just cross over to the bureau dresser and examine the jewelry box, instead. At least that seems harmless enough. How’d he do that? Must be “mirrors” or “subterranean streams” or something…. Well, there’s another empty hearth… Has anyone seen any coffin-shaped cinders yet??? We should back out of the fireplace, turn right and carry on to the wardrobe. You know, the British are a sensible people… no closets. They have “Wardrobes” instead. Why? Oh, that’s so easy! So they have some place to hide “The Witch…The Lion…” Oh, Gee! …What a bunch of "grumpyboots", you lot! I thought it was funny…. Let us turn from this series of unfortunate events (oops…pardon me, that’s another game… teehee!) to the right and examine that strange thing on the far bed pillow. Oh dearie me! Is it somebody’s severed arm? OK, who’s gonna click on it? … Well, I’m not going to! Will some one please click on the severed arm so that we can continue? …Finally, a brave soul! Thank you. Welcome to the third ghost story (and a particular favorite of mine) known as The Silent Pool. Told to us deftly by Dr. Grimalkin. Back out and away from the royal glove and turn to the right. So, tell me… which side are you leaning toward? Have you figured out about “Easter”? Good, let’s go then. Turn to the right and then exit out of The Nanny’s Room and onto the second floor balcony. From here go across the balcony, turn left and start down the stairs. At the bottom of the staircase turn left. See it? What you need is on the far table. Cross the Main Hall to the far table with the two primitive statues on it. Upon closer examination we find a key! Maybe it’s for that door in the Nanny’s Room. Meet you back up there. I’m glad to see you made it back here in one piece. Do you still have the key? Hmmm, the crib appears to be empty. … pleasant enough for a baby…not! Back out of the drawer and let’s have a gander at the photo on top of the dresser, listen to an eyewitness account of The Haunted Mirror. After that you can play with the Mandarin Coin Bank. So, that’s where all my money goes! Turn from the dresser and examine the “jack-in-the-box” and the large wardrobe. Still haven’t been able to catch the witch or the lion no matter how quick we are, huh? Turn around and examine the horse slide. It doesn’t really do anything; I just wanted you to have a look at it. I’ve always been fascinated by them. My brother had one when we were little…I used to believe that it was haunted because it used to slide back and forth by itself at night…Creak…creaakk…creeaakk, it would wake me from my sleep and I would watch, mesmerized as it would slowly move back and forth in the moonlight taking it’s its invisible rider to far away enchanted lands… ok I’ll stop. Hmmm another fireplace… probably nothing in it either, but go ahead and try it. Let me see… Hey! How about that? Is it getting cold in here or is it just me? 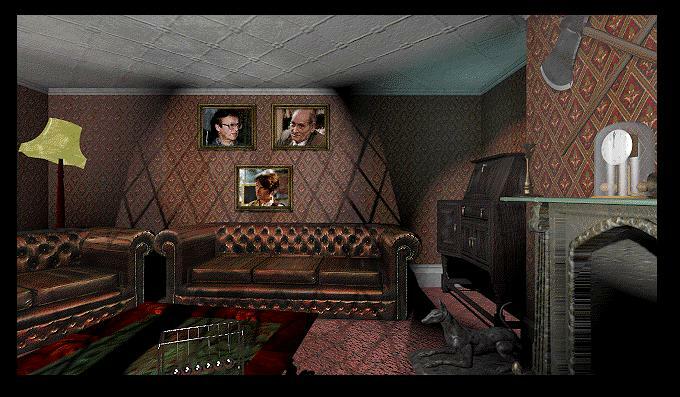 What’s that on the wall to the right of the crib? That smudge in the wallpaper. Sorry, looks like I couldn’t help myself again. Turn to the right. Before we leave The Nursery, maybe we should have just one last look. Turn once again to the right. Hmm, did you notice that floorboard over there? You know, they say that sometimes when you do renovations to an old house it stirs up more than dust. Let’s be brave and have a lookie see. Oh, come now… you’re not chicken, are you? Hmmm? Why, it looks like children’s drawings, doesn’t it? Let’s click on them. Enter the Master Bed Chamber. Move forward twice and then turn to the right. Let’s examine the dresser first. There’s something in that bottom drawer…care to have a look? Whoops! Well, we’ll just close that up straight away and forget about it. I think it might be a safer bet to click on the black box on the top of the dresser. First, click on the photo file. Oh yes, it’s our dear “skeptic” Dr. Blackmore. Next let’s have a “read” with the paper entitled “Skeptics”. Interesting, no? Hmm … there’s a “Believers” file somewhere as well. We should make a note to find it. Click on the videotape box and listen to the Skeptics: Dr. Blackmore and Tony Cornell relate a few more of their experiences. Back out and away from the dresser and turn to the left. Yup, it’s another wardrobe… probably empty like the rest. Beg pardon? Ok, go ahead and open it if you must… I’ll wait here. Next, are the fireplace and its mantle. Well, what do we have here? Here is a photograph, a painting of “Stonehenge” and an open hearth. Shall we try the hearth first? What the heck was that? Did you see a face in there? I did. How about the photograph? An eyewitness account retelling an experience of A Haunted Restaurant. Last but surely not least, click on the painting of Stonehenge. What were you expecting? The Mystery of the Druids? Shheeeesh! Ha! I knew it! He IS Dracula!!! Finally, let’s have a look at the Ghost Hunter Brochure. Make sure you turn all the pages to get the full effect. Sit back and listen to Dr. Robin Furman speak about his group “Ghostbusters UK” and learn about Tony Cornell and his S.P.I.D.E.R. project. with Dr. Robin Furman and Dr. Susan Blackmore. Back out of the portraits and move to the foot of the bed. I guess we really should have waited until the maids came in to make up the room huh? Ohh… see what happens when you click on the pillows??? Gee, I wonder what has happened to our dear Dr. Grimalkin? You know, I have to tell you that Dr. Grimalkin must be very well acquainted with my late grandmother, because so far every single superstition or wives’ tale, which he has imparted to us during our tour here, my grandmother had taught me long, long ago. Exit from the Master Bed Chamber back out onto the Second Floor Balcony. Move to the first staircase, turn right and go down to the Main Hall. Turn left, move forward and turn left again. Move forward to the door on the right side of the Diving Helmet. Go through the door, this time turn left and then forward and forward again. Move up the narrow stairway until we come to a closed single door. Open the door and enter. Dreary, isn’t it? This is where the servants would sleep, or the poor relations maybe. Couldn’t you guess? There he is. Now, sit back and listen to the retelling of the fifth ghost story and the chilling legend of The Bride of Marlborough Hall. Move around to the far side of the bed and the small mirror and washing stand. But before you click there, click on the black box, which is sitting on the bed. Ahhha! We’ve found the Believers Tape! First click on the photo file of Social Worker, Jane Hartley. Next, read the paper on the “Believers”. Finally, click on the videotape and listen to the good Reverend (don’t make me say his name again) discuss The Catholic Church’s take on Ghosts and Jane’s recounting of her ghostly episode. Then hear Tony Cornell offer the scientific viewpoint and Dr. Robin Furman speak of one of Ghostbusters UK’s investigations. Notwithstanding green swirling mists and millions of lights, have you checked your reflection lately? Turn left from the washstand and then forward to the wardrobe. Ohhh, all right…. I guess it won’t hurt to check out the wardrobe. Go ahead … click on it. I know I’m the tour leader. I… uh…have to always stay in the background so that all of you can truly benefit from the tour. …Yeah … that’s the ticket. I guess we should try the face…. Here we find Dr. Grimalkin and the sixth and final ghostly tale otherwise known as “Wicked Jimmy”. Jeepers that was a rather ghastly legend! Let us turn from this room of horror and putrefaction. Exit from the Wardrobe through the Small Attic Bedroom, down the stairs and out to the Main Hall once again. This time turn around and enter the closed door to the left of the Diving Helmet. Open the door and move down the stairs to the Cellar. Turn to the left and move forward. Back out from here and turn to the right, move forward to the far table with the lamp on it. I wonder what this gadget is? Ahhhhaaa! It’s the “Terrifying Entity Dealer”. I wonder if these people are friends with Violet Baudelaire? After we’ve finished playing with—I mean researching T.E.D. have a look at the photographs of Tony Cornell’s S.P.I.D.E.R. contraptio- pardon me. I meant to say invention. Where did I put that snake oil???? Oh Dr. Grimalkin… yooooohoooo! Moving on, let us take a look at that black box with the colored lights on it to the right of the photos. This is a mood detector. Rodney Mitchell explains its use. Next, click on that large black box on the far right of the table. Dr. Furman explains the “Wand Sensor” and its use. … You just can’t make this stuff up, folks. … Oh, Lordy! This should be good. …Oh wait a minute I know what that is! That’s that green swirling mist that Dr. Furman and his Ghostbuster UK cohorts er …uh... that is esteemed group of scientists must have captured with that huge T.E.D. paramilitary machine gun thing, right? The bottom drawer holds a file on the subject of Ghosts and Technology and there’s even videotape, cool! Well, how informative, I must say. Next we’ll take a look at the center table, here we find a computer, which is running a very interesting Parapsychological Glossary program on it. A very familiar box (can you see what it is?) and a slide projector with two very interesting slide shows. 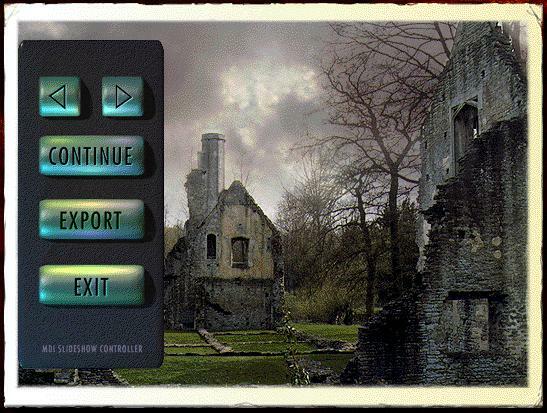 The trick here is to approach the projector from the rear and then click on the slide carousel on top of the projector and then click on the screen on the wall to view The Haunted Realm: England’s Supernatural Sites. The second carousel holds the program entitled: The Ghosts of Olde England. Either one of these programs can utilize the “export to bitmap” function by simply clicking on any of the actual images. Some of these are truly breathtaking. 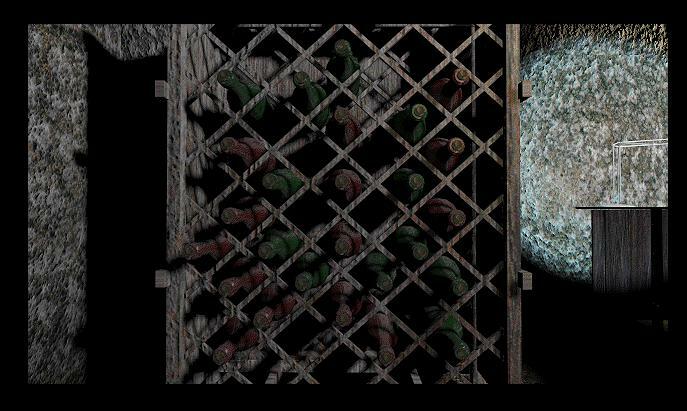 When we’re finished perusing these hauntingly ethereal images, there is still one more place to discover in every upstanding English Manor… and that of course is the wine cellar. Back out from the slide projector and turn to the left and then left again. Now move forward. Now move forward and then turn to the right. Back up one to get a full view of the wine rack. Yes… ladies and gentleman… I give you GHOSTS’s other puzzle. (You see? There were only two.) Let me think a minute…. Remember what Dr. Grimalkin said upstairs in the kitchen when we opened up the drawer and saw the corkscrew? 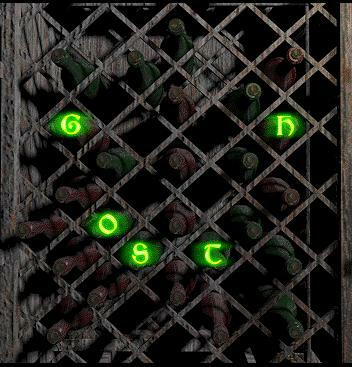 He said, “Remember the words of the Spirit.” Try clicking on one of the bottles, hmmmm we get a letter and a ghostly voice saying that letter. So let’s see what happens if we click on the topmost bottle. Well that was “A”, try the next down and to the far left. That one is “B”. The one in the same line and to the right is “C” …but notice how they are not staying lit? Continue on until we come to the letter “G”. The next bottle directly across to the right of it is “H”. Notice how these two are remaining lit up? It wants us to spell out a word… figured it out already? Of course you did. I can’t fool you, can I? Let’s compare notes, then, shall we? Did you hear the ghostly voice of Bill from the Enfield Poltergeist Case spell out GHOST? Unnerving isn’t it? Well, now it looks as though we’ve discovered a secret underground tunnel. Shall we see where it might lead us? Hmmm another painting. This one looks like modern art. Doesn’t it? Let’s have a closer look. …. Mislead us? I knew it…. I just knew it. You just can’t trust anybody nowadays! If you haven’t had a chance to finish reading through The Book of Hauntings you may want to complete it now. You can save any of the stories or export the images by clicking on FILE at the top of the game window and then choosing EXPORT. One last thing you may want to do … in the far corner of the Library is a Coat of Arms or Shield. Click on it now and enjoy the credits. And don’t forget to leave your magnifying glasses outside the front door as you leave. written permission of the author and the content may not be altered in any way.